I was one of a small group of colleagues from MERL who attended the MA conference earlier this month. I was there to lead a session entitled ‘Overcoming your fears of working with volunteers.’ The session was devised to extract concerns about working with volunteers, explore them and discuss how to combat those worries. We began with some group work when each group was given a few children’s comics to create and visualise their fears of working with volunteers. This encouraged conversation and discussion between colleagues, as well as giving me a foundation to bottom out people’s worries and concerns. One of the fears that arose was: “How do you address volunteers who do not dress appropriately for their role?” My answer to this was to use role descriptions and state in those that there is a dress code required to fulfil the role, also use training and induction to install a dress code. If a volunteer persists to dress unsuitably then you are within your rights to ask them to alter their dress code for the role. From this point another discussion arose and that was the use of volunteer agreements. There is some debate in the voluntary sector over the use of these. A volunteer agreement is a signed document between the volunteer and a member of staff, stating that they are aware of what is expected of both of them. At the University Museums and Special Collections (UMASCS) at Reading we do not use volunteer agreements as I prefer not to enter anything that may be considered contractual; however there is lots of advice on how to write a volunteer agreement without using language that may possibly implicate a legal contract. We do, however, have one agreement form used by archive volunteers who may be volunteering with confidential data. This form states that they are aware of the nature of the material they are handling and that they are not at liberty to talk about it. The conclusion of this discussion was that the use of volunteer agreements are at times necessary for the role required. Another fear that arose was: “Volunteer supervisors and managers are concerned about the length of time a volunteer stays within an organisation and sometimes it is hard to let go.” My response to this issue was to suggest creating volunteer projects set within time restraints therefore managing expectations. I also suggested the use of role descriptions to manage time limits and volunteer responsibilities. After my interactive element of the session, I invited Amanda Lightstone, Opening Doors Project Coordinator from the University of Cambridge Museums, and Gemma Waters, Museum Development Officer from Cumberland House Portsmouth, to talk about their experiences of working with volunteers. They provided anecdotal presentations about their work and explored good practice regarding recruiting and retaining volunteers. 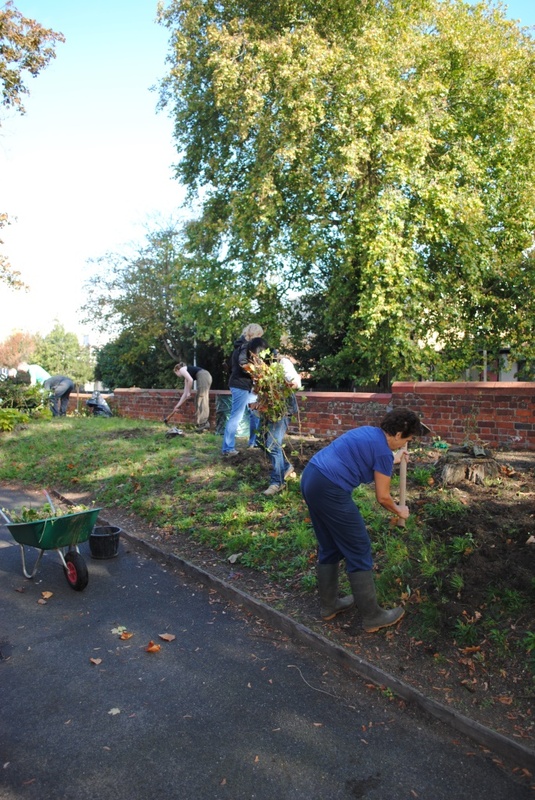 I like to think the session left everyone feeling enthused and invigorated about working with volunteers! Did you watch the Great British Sewing Bee? I’ll admit that I was sceptical at first, not being a fan of “reality” television, but I have to confess I’ve been glued to every episode, and was delighted to see Ann’s years of experience win her the trophy. As a dressmaker myself, I’ve been very impressed by the wide range of skills demonstrated by each of the participants, and their ability to stay calm under pressure. 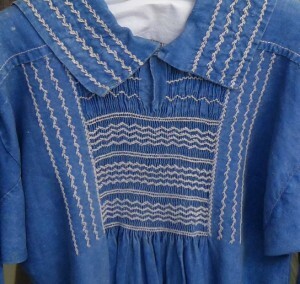 I first became involved at MERL thanks to my passion for sewing. I visited one weekend, and was lucky enough to catch the tail end of a guided tour that took us into one of the museum’s open storage areas, where I was able to see the extent of the smock collection. I wrote a post about it on my own blog, and was contacted by the Assistant Curator who invited me to get involved as a volunteer. A week or so later I found myself working in the museum alongside another volunteer, helping to record the measurements and condition of all of the smocks. One of the things I found most fascinating was the fact that because most of the museum’s smocks pre-date the domestic sewing machine, they’re almost all made entirely by hand – not only the smocking and embroidery, but also the long, functional seams. When I tried my hand at a bit of smocking for myself, I was surprised by just how slowly the work progressed. You certainly couldn’t run up a smock in the measly four hours allocated to the Sewing Bee finalists to make a modern man’s shirt! A couple of weeks ago at MERL we were delighted to host a group of visitors from New Stitches Magazine, all of whom had been watching the Sewing Bee with great interest, and were fascinated not only by the range of objects we were able to show them from our textile collections, but also with our sewing machines, which range from domestic models to very specialised industrial equipment. My personal favourites from the objects brought out for the group are the Dorset Buttons – another hand-sewing technique that I tried out after having seen the collections for myself. It’s four years since my first visit to MERL, where I now work as Learning Assistant and Visitor Services Assistant. My experience volunteering with the smock collection led directly to me volunteering in other areas of the museum that I also found interesting, and now part of my role is to create family craft activities which are inspired by the museum’s collections. The sewing machines, smocks and other textiles collections are currently housed in our object stores on the mezzanine level at the museum. Currently, the only way to access those collections is to come on a guided tour and ask your tour guide to include the store in your tour, or if you wish to study the collections in more details, to make an appointment with a Curator. It’s a shame they are not currently more accessible, but as part of the Our Country Lives project we’ll be looking at ways that these fascinating collections can be incorporated into the main displays. The more interest there is in them, the more likely this is to happen, so leave a comment & let us know if you’d like to see more of the textile treasures. So if the Great British Sewing Bee has inspired you to dust off your sewing machine and have a go, why not come and see the MERL smocks? Who knows where it might lead you! 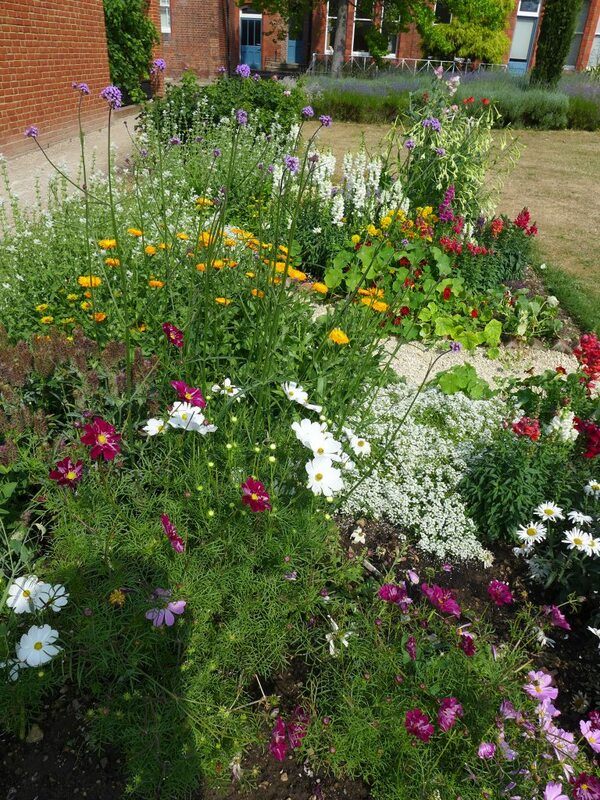 Written by Greta Bertram, Project Officer for A Sense of Place and Countryside21. MERL has a fantastic array of traditional craft products and tools in its collections, from such crafts as blacksmithing, wood turning, carpentry, lacemaking, leatherwork, pottery, stonemasonry, straw crafts, and wheelwrighting (plus many many more!). Many of these objects are on display in the Museum’s gallery, and visitors to MERL can also watch videos from a project called Rural Crafts Today, showing ten contemporary traditional craftspeople at work (short versions of these films are also available online). The craft collections are one of the things that first attracted me to the MERL, and my first visit to the Museum was to interview the former Keeper, Roy Brigden, about craft and intangible heritage in museums. In my life outside MERL I’m a trustee of the Heritage Crafts Association (HCA), the advocacy body for traditional heritage crafts. The HCA aims to support and promote traditional crafts as a fundamental part of living heritage in the UK and to ensure that those craft skills are carried on into the future. I’m always on the look out for potential collaborations between MERL and the HCA, and there are a lot of crossovers in the work that I do. During the sixteen months I’ve been working at MERL I’ve catalogued a good proportion of the craft objects, and undertaken engagement activities with basketmakers in my MERL-HCA capacity. You can find out more on the Sense of Place blog. 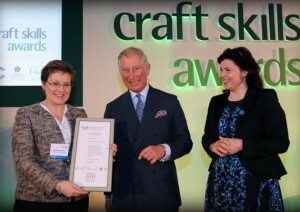 Prince Charles and Kirstie Allsopp at the Craft Skills Awards. Last Thursday I attended the inaugural Craft Skills Awards, a national suite of awards to recognise best practice in passing on craft skills. The awards were set up by Creative & Cultural Skills and partner organisations, including the HCA. The prizes were awarded by His Royal Highness, The Prince of Wales – Patron of MERL, and President of the HCA. The categories included ‘Encouraging Craft Skills in the Workplace’, ‘Encouraging Craft Skills in an Educational Setting’, ‘Encouraging Craft Skills in an Informal Setting’ and ‘Engaging New and Diverse Audiences in Craft Skills’. You can find out more about the awards and the winners, and watch a great video about why we should support craft, here. I was lucky enough to meet the Prince and to say thank you for giving a wonderful speech in which he quoted some of the findings from a new piece of research which I’ve been involved in, Mapping Heritage Craft, highlighting the issues faced in skills transmission. Both the Craft Skills Awards and Mapping Heritage Craft also highlight the vibrancy of the traditional crafts sector, as there is a mistaken tendency to think that these crafts are dying out and are no longer part of our contemporary rural (and urban) landscape. We’re hoping to be able to reflect this is in the new displays at MERL, and I think it would be great if we could find a way to present some of the more ‘intangible’ elements of traditional craftsmanship as well as the tangible objects. I will also be running the HCA stand at the MERL Village Fete on Saturday 1st June, with the help of a local spoon carver. This year’s fete has a traditional crafts theme and there will be several craftspeople demonstrating their skills on the day. Come along for a great day, a look round the museum and to find out more about the HCA! MERL Traditional Craft Fair 2012 – calling local craftspeople! We are pleased to announce that following the continued success of the Museum’s Traditional Craft Fair, we will be running the event again this year on November 10th, 11am to 4pm. The emphasis is on traditional and heritage crafts and stallholders are encouraged to demonstrate on their stands and are welcome to offer small hands-on activities for visitors. The Museum also provides a free drop-in activity for families and refreshments are available in our ‘Studio Cafe’. Craftspeople and makers are invited to submit applications for stalls by Thursday 7th September. To read the stallholder information and download the application form, please see the MERL Traditional Craft Fair 2012 page. With the school summer holidays approaching, the Museum of English Rural Life (MERL) is launching new family tours as part of its exciting summer programme. The Museum, which is owned and managed by the University of Reading, was recently nominated as one of the country’s top 20 Family Friendly museums by Kids in Museums, but far from being content with this achievement, the team at the Museum is constantly looking for ways of improving visits for its youngest visitors and encouraging families to come enjoy the Museum. This August families will be able to take part in free, interactive tours specially designed to help them engage with and understand the stories behind the Museum’s collections. 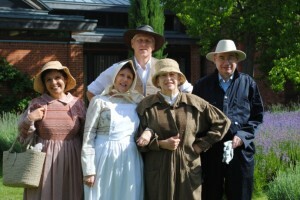 Families will meet characters from England’s rural past, such as Alan the sheep shearer, Dave the blacksmith, Molly the dairy maid, Gabriel the farm hand and Maggie the Thatcher and visit the Museum with them as they bring to life what it was like to work in the villages, farms and fields of the past and tell their personal stories. Each 30 minute tour will be delivered by two characters from the team. The tours have been developed by staff and volunteers in the MERL tour guide team with the aim of bringing to life the objects on display in the Museum and helping families get an idea of what kind of lives the people who used them might have lived. The tours take place on 8th, 15th and 22nd August, at 11:30 at the Museum of English Rural Life, they are free but booking is required as places are limited. To book, and for details of the tours and other events in the Museum’s programme of summer events for families, visit the website at www.reading.ac.uk/merl or call 0118 378 8660 during opening hours. For more information about the MERL’s summer programme, visit www.reading.ac.uk/merl or call 0118 378 8660. For more information for media, contact Alison Hilton, Marketing Officer at the Museum of English Rural Life on 0118 378 8660 or Pete Castle at the University of Reading press office on 0118 378 7391 or p.castle@reading.ac.uk. 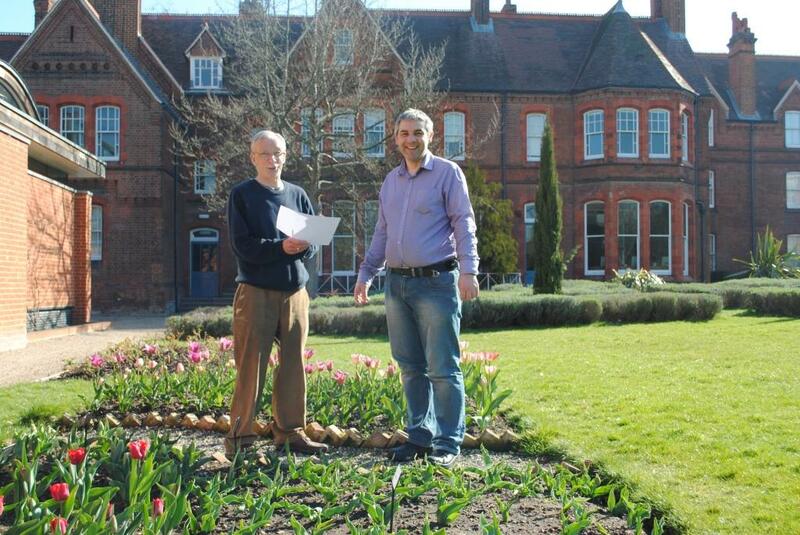 MERL, part of the University of Reading, draws on and adds to the University’s unique research into agriculture, history and rural practices, and has collections permanently open to the public at the University’s historic and recently refurbished London Road campus. 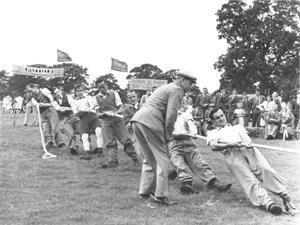 As the crowds gather to welcome the Olympic torch to Reading, the Museum of English Rural life at the University of Reading is reflecting the influence English country heritage has had in world sport – including helping provide the spark for the modern Olympics. The torch will come to Reading on Tuesday evening (10 July), carried along the A4 London Road between 6.14pm and 6.34pm, before an evening celebration at the Madejski Stadium, where the flame will be kept overnight before continuing its journey around Britain the following morning. Just yards away from the official route, the Museum of English Rural Life (MERL), part of the University of Reading’s London Road campus, will stay open until 9pm on Tuesday to give anyone coming to the area the chance to visit the exhibition Playing Fields: Our Sporting Life in the Countryside. The exhibition, which runs until 16 September and is free of charge, takes a look at the rural sports that changed the world – and one or two that didn’t. The opening ceremony of the London 2012 Games will feature the British countryside and farmyard animals, acknowledging the importance of rural life in shaping modern Britain. Playing Fields is an opportunity to look back with pride and to enjoy and explore a peculiarly rural, and peculiarly British, take on sport. It also showcases the influence of rural life and rural sport on the Olympic movement. For instance, the Olympic ideal owes much to the market town of Much Wenlock, Shropshire, a quiet English parish in which a local agricultural society promoted the idea of an Olympian Class prior to the re-establishment of the modern Olympics by Pierre de Coubertin in 1896. With items drawn from the museum’s diverse collections, Playing Fields takes a light-hearted look at major sports like football and cricket, the roots of which lie partly in traditional rural contests. It also sheds light on less familiar but equally fascinating activities, from the thorny challenges of competitive hedging to the little-known ballgame knur and spell. Guy Baxter, of MERL, said: “We were delighted to discover that Danny Boyle, the director of the Olympic opening ceremony, had singled out the influence of rural life in Britain as the key message of the opening event. MERL is about recording our rural past and helping people to learn about it. This display forms part of a project co-ordinated by the Heritage Sports Network to showcase the wealth of sporting history in the United Kingdom. This national exhibit explores the huge contributions made by British sportsmen and women over the last century. For more information about the exhibition, visit www.reading.ac.uk/merl or call 0118 378 8660. For more information for media, contact Pete Castle at the University of Reading press office on 0118 378 7391 or p.castle@reading.ac.uk. MERL is asking for local people to contribute ideas for a project that is producing a record of the Berkshire countryside. MERL, which is owned and managed by the University of Reading, is currently hosting Field work: photographs from East Anglia, an exhibition of photographer Justin Partyka’s work exploring the lives of those whose identity stems from a close relationship with the landscape. Now, with support from Arts Council England, MERL has commissioned Justin to photograph rural Berkshire. From Friday 23 to Sunday 25 March MERL has organised workshops in The Oracle shopping centre, led by Justin’s colleague Bee Farrell, where local people can provide information on local family names as well as describe their favourite places around Berkshire. Justin began working on his ‘Project Berkshire’ in February, exploring and photographing farms and landscapes around the county. The results of his first foray can now be seen in the form of a ‘pop up’ exhibition, mounted in partnership with ‘Jelly’ in empty shops in central Reading. The workshops are supported by the Earley Charity and arts organisation Jelly. To find out how to get involved in ‘Project Berkshire’, visit the MERL website or call 0118 378 8660. The Museum of English Rural Life has teamed up with Reading Post/getreading to invite the public to record their favourite rural places in Berkshire and win great prizes. As part of his ‘Field Work’ exhibition currently at MERL, Justin Partyka has been commissioned by the Museum, thanks to an Arts Council grant, to capture images of rural life here and wants local people to join in and contribute to his ‘Project Berkshire’. For details and to find out how to enter your pictures in the photography competition, visit Your Project Berkshire on the MERL website.